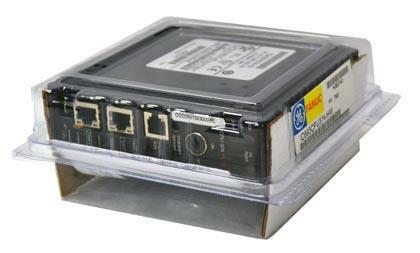 Description: GE Fanuc CPU 374 Module (240K Bytes configurable user memory), Embedded Ethrnet 10/100Mbs w/built-in switch. No serial ports. IMPORTANT PRODUCT INFORMATION READ THIS INFORMATION FIRST Product: IC693CPU374 CPU Module with Ethernet Interface IC693CPU374-AB with CPU Firmware Release 11.00 Introduction This document contains information that is not available in any other publication; therefore, we recommend you save it for future reference. This document discusses firmware release 11.00, the introduction of a new Series 90-30 CPU module IC693CPU374. CPU364 Features Not Supported in the CPU374 The following features on the CPU364 are not supported in the CPU374: SRTP Channels (COMMREQs for Ethernet messages.) Name Resolution BOOTP Hand Held Programmer AAUI Port Note: External battery module (IC693ACC302) is required to support battery backup for a poweroff time of 1.2 months or greater. (For more details, see Operating Notes on page 4.) New CPU Features Higher Performance CPU The CPU374 features an increase in logic execution speed compared to the CPU364. Boolean contacts execute at a speed of 0.15 milliseconds per 1KB of logic. Non-boolean logic (including C blocks) execute at least twice as fast as on a CPU364. The CPU374 also has hardware support for floating point arithmetic. EZ Program Store Device The CPU374 supports the EZ Program Store device, allowing the user to store the configuration and program without the need for a PC. For additional information, see GFK-1811 version B or later. SVCREQ #24 A new service request, Reset Smart Module, is added to the CPU374. This service request can be used to reset a faulted smart module through ladder logic. 2 Important Product Information GFK-2123 New Ethernet Features The CPU374 provides network communications using SRTP (Service Request Transfer Protocol) over standard TCP/IP (Transmission Control Protocol / Internet Protocol) on an Ethernet Local Area Network (LAN). The CPU374 also provides network communications using EGD (Ethernet Global Data) over UDP (User Datagram Protocol) on an Ethernet Local Area Network (LAN). The CPU374 supports communications with other IC693 PLCs, IC697 PLCs, and IC200 PLCs equipped with TCP/IP Ethernet Interfaces. Note: The CPU374 hardware receives and processes all group- (or multicast-)addressed packets on the Ethernet segment to which it is connected. The CPU374 will experience performance degradation when connected to networks that have EGD group traffic or other multicast traffic, even if the traffic is not intended for the CPU374. Embedded Network Switch The CPU374 supports connection to an Ethernet network via an embedded network switch with two front-panel RJ-45 Ethernet connectors. Two 10Base-T / 100Base-TX Auto-negotiating Full-Duplex Ethernet Ports The CPU374 provides direct connection to one or two 10Base-T /100Base-TX CAT5 (twisted pair) Ethernet LAN cables from two network ports. Cables may be shielded or unshielded. It is important to realize that the two ports are connected to an embedded network switch. The CPU374 has only one IP address. There is not a separate IP address for each port. Caution The two ports on the CPU374 must not be connected, directly or indirectly, to the same device. The hub or switch connections in an Ethernet network must form a tree and not a ring, otherwise duplication of packets and network overload may result. Caution The IEEE 802.3 standard strongly discourages the manual configuration of duplex mode for a port, as would be possible using Advanced User Parameters (AUP). Before manually configuring duplex mode for a CPU374, be sure that you know the characteristics of the link partner and are aware of the consequences of your selection. Setting both the speed and duplex AUPs on a CPU374 port disables the port s auto-negotiation function. If its link partner is not similarly manually configured, this can result in the link partner concluding an incorrect duplex mode. In the words of the IEEE standard: Connecting incompatible DTE/MAU combinations such as full duplex mode DTE to a half duplex mode MAU, or a full-duplex station (DTE or MAU) to a repeater or other half duplex network, can lead to severe network performance degradation, increased collisions, late collisions, CRC errors, and undetected data corruption.